With over 15 years experience in providing the Greater Houston area with safe, effective underground electronic dog and cat fencing and secure pet doors, Doggie-Do-Rite has the know-how to meet virtually any pet containment need. Give us a call today and find out how Doggie-Do-Rite can help you keep your pet safe, happy, and healthy! She began to research hours on end to find a solution. Lucky was a member of her family, and they all wanted him to stay safely at home where he could live a long, happy life. Upon finding a solution, Tina thought that other families might have similar problems thus, Doggie-Do-Rite Hidden Pet Fencing and Doggie Doors was born. 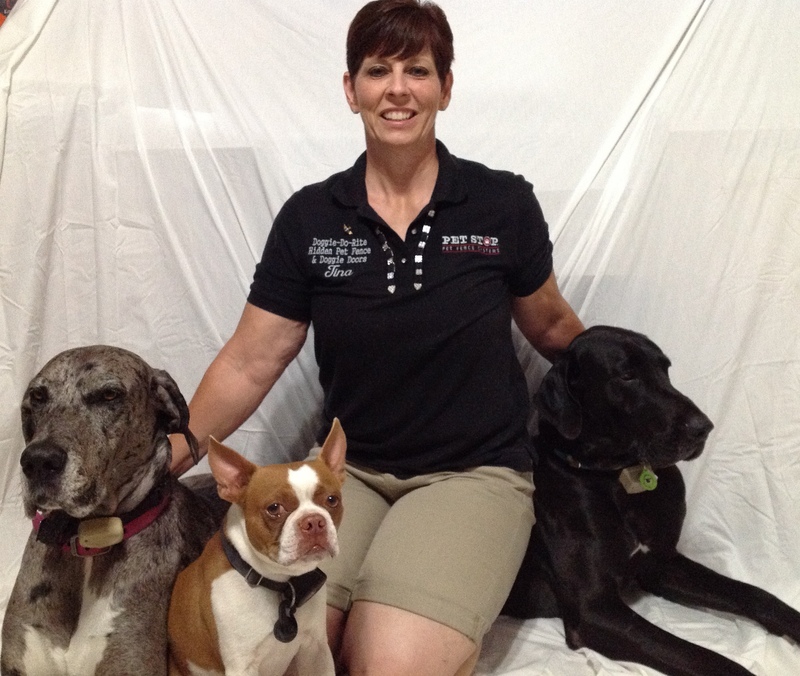 For over fifteen years, Tina Moreno has been in the pet fencing business. She has been at every install and taken care of every customer. Doggie-Do-Rite is truly a family owned and operated, local business. Her husband, Robert Moreno, handles all dog door installs. Both of Tina’s children, Kendra and Robert Moreno jr, have or still do handle various sections of the business. Her father, Rocky, assists with installs. Doggie-Do-Rite is, at its heart, about family, whether it’s ours or yours. Currently, Tina Moreno has a total of six dogs that rule the house and yard: three Great Danes, one Black Lab, one Boston Terrier and a Chihuahua mix. The Danes and Boston Terrier work as Sales Dogs and travel to every Home Show. They are our top “salesmen”. When Tina isn’t working, she enjoys Scuba Diving, Traveling, and Shopping. Although Lucky is no longer with us (1999-2015), Doggie-Do-Rite will never forget the reason it began its journey long ago: for a stubborn stray dog who decided he didn’t ever want to leave. Thank Goodness for our fur-miracles. Our mission at Doggie-Do-Rite Hidden Pet Fences is to keep your pet safely and securely contained to your property and as your local pet fencing experts, we’re dedicated to bringing you not only the most advanced, most customizable electronic pet fencing system available on the market, but also the best customer service. We’re your local dog-fence experts, providing region-specific service in Greater Houston, Texas. We understand this area more than our competitors, and will work with you to design a solution catered to your location and needs. Only Pet Stop® provides the most gentle and humane dog fence training program. GentleSteps ensures that your pet learns their new boundary without any discomfort. The Pet Stop® brand is known by those in pet containment as the best in premium products and services. When you decide to purchase a Pet Stop system or replacement, you’re choosing top-quality for you and your pet.